Is your dog one cool dude? Does he have a rock 'n roll edgy vibe? Or maybe your darling's a bit of a diva. Your dog is totally unique and you know it! That's why you want an id tag that perfectly suits your pet's personality. 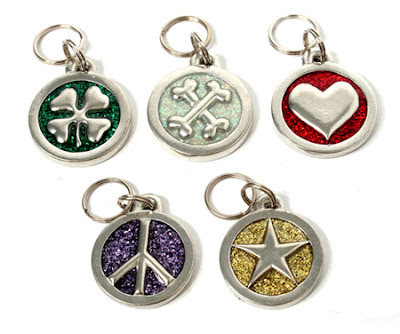 Rockin' doggie is a new line of designer id tags at PetBling.ca. All rockin' doggie tags are "handcrafted in the United States using the best materials available and the highest level of craftsmanship". These id tags are made from pup safe, lead-free pewter. They are simply gorgeous! Our selection of rockin' doggie disc tags feature a recessed glitter background and a variety of center shapes: heart, four-leaf clover, peace symbol, crossed bones, and a star. Perfect for pet people who want a cool, yet elegant looking tag. These disc tags are durable! 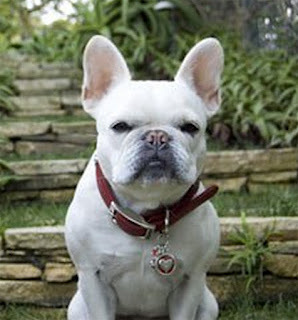 At 25mm diameter (about the size of a quarter), they will fit nicely onto the collars of most sizes of dogs. Looking for a totally unique tag for your little diva or rock star? The 'Diva', 'Spoiled' and 'rockin doggie' tags are both fun and sophisticated. These pet tags rock the trendy layered look! An inscribed ribbon, heart and doggie bones work together to produce a visually fabulous tag. The lettering on the tag is slightly recessed and darkened. Also made from lead-free pewter, this style of tag feels light (perfect for little dogs), yet it's hardy enough to withstand most doggie antics. This is the Yorkshire Terrier of pet id tags! Medium and larger sized cool canines can also have fun with the rocker chic look, too! The engraveable guitar pick id tags pay homage to the legends of rock and roll. They are a totally unique style of dog id tags. The lettering is slightly recessed and darkened. You'll notice the high quality of rockin' doggie tags the minute they're in your hand. The edges are smooth, the lettering and designs are exceptional and the attention to detail is outstanding. 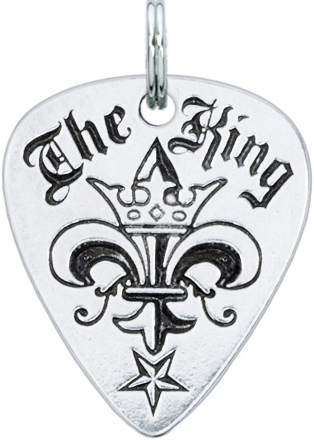 I love rockin' doggie's guitar pick tags so much that I now have the Elvis inspired 'The King' on my keychain! 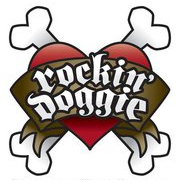 As an added benefit, rockin' doggie donates a portion of all proceeds to providing dogs to those with special needs! PetBling.ca is proud to carry a large selection of dog id tags from rockin' doggie. We think that these are some of the best and coolest pet identification tags on the market!